It’s late November and although all my organised forays are over for the season, there are still numerous edible species out there to hunt for. Alas this autumn has been as much about politics as it has about foraging, with The Forestry Commission in Hampshire announcing a full ban on picking and then doing something of a U-turn when they were forced to admit that their ‘ban’ had no basis in law and was utterly unenforceable. Most of my opinions on this whole topic can be found here if you’re interested, click the image. Almost a year of meetings, phone calls and emails later and I hope we are getting somewhere and forming a sensible working relationship between them and us, the us being The Association of Foragers https://foragers-association.org.uk which was formed last year more as a network of professional foraging teachers than a lobbying organisation. Either way it has soured the season for me a little and I vow to concentrate next year on enjoying the autumn for what it is and not getting involved in this on going squabble, hard as that is with the national press always eager to poke the fire and stir up the flames. Anyway, apologies for the mini rant and back to the topic in question…2 years ago I produced a short film about a few of the principles of safely identifying wild mushrooms https://www.youtube.com/watch?v=cV_aXE0sLcY and this year I have finally created a follow up. Please, if you haven’t, be sure to watch the first film as well as this one; it looks in more detail at some of the basics, safety tips and common sense needed to approach a topic that has as many potential pit-falls as this one does. 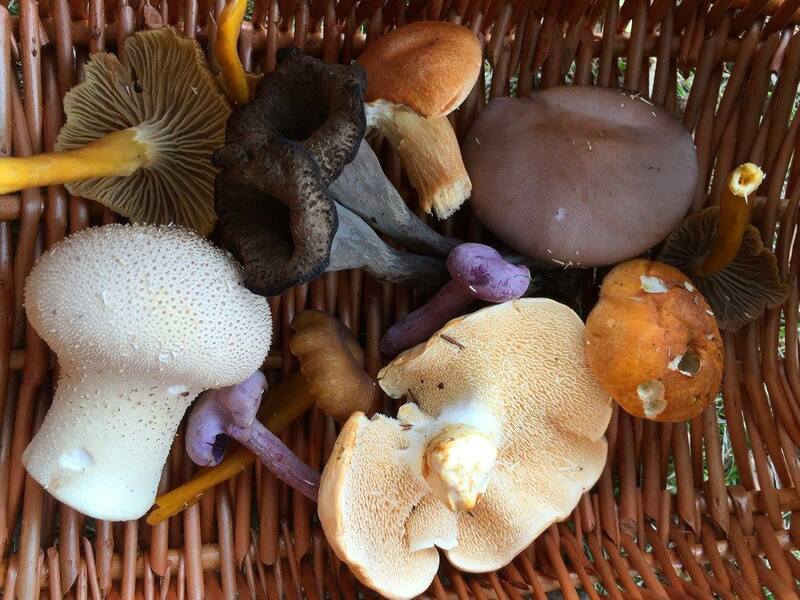 I hope you find this useful and that if nothing else it inspires you to go out for an autumnal woodland walk, although for anyone serious about hunting for edible wild mushrooms there is no better beginning than to go on a few organised forays with someone experienced who can introduce you to the basics and keep you safe at the same time. Excellent watch , thanks for that. What a lovely assortment of fungi. A close up shot would be so helpful, for ID. I’ve just returned from a weekend in the New Forest and I was shocked by the scarcity of fungi in all the environments I encountered. This year I saw few individual and mostly old fungi but no abundance of varieties that as a regular Autumn visitor l am accustomed to. Do you know why that might be? Thank you for your prompt response. It certainly has been an odd year: in the infancy of an age of increasing instability. Wildlife too, was scarce. I saw no deer and few birds, but Autumn amongst the trees of the deciduous forest is a visual delight. As a follow up question; though the season was advanced, is the fruiting duration a constant length even though the mild weather continues? Previous post: The Edible City : A Year of Wild Food.